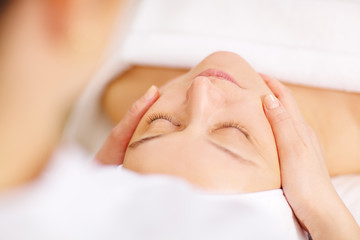 At Porefessionals we pride ourselves in a clean, relaxing, and soothing experience paired with optimal results. We use state of the art equipment which offer the latest advancements in skin care. We use only the best products which have been created and tested in a labrotory by scientists and have been proven to produce results. Microdermabrasion is a skin-freshening or exfoliating technique that helps to repair the skin. Our skin takes a beating from the outdoors. The sun and has dramatic effects on the skin and so do the toxins and pollutants in the air. A microdermabrasion machine is like a fine sandblaster that sprays air and the diamond attachments using gentle abrasion along with the suction to remove dead skin cell or the outer layer of the skin. It is necesssary to remove the dead skin cells as our skin regrows approximalty every 20 days. Microdermabrasion is effective in reducing fine lines, "crows feet", age spots, hyper pigmentation, and acne scars. It stimulates the production of skin cells and collagen. There are virtully no side effects and no down time or recovery time. This procedure leaves the skin feeling smooth, lighter, brighter, tighter, with a healthy-looking glow. It is effective on all skin types and is excellent for skin that is sensitive to chemical procedures. Ultrasonic technology is popular for its wide care range and rapid effect. Acoustic vibrations which stimulate the skin tissue and improves cell membrane and causes collagen regeneration. Reduces wrinkles and fine lines, for younger looking and feeling skin. Ultrasonic also generates frictional heat which accelerates blood circulation and helps muscles to relax, decomposes cellulite, and aids in deeper product penetration into the skin. Mechanical Function: Using 300 million time per second mechanical vibration to make the whole body vibrate and do the special cell massage function, which improves metabolism and blood circulation. It also helps to keep skin tissue nutrient, which improves elasticity and makes skin look radiant. Chemical Function: Ultrasonic waves stimulating effect aids in boosting metabolism. It increases the alkalin which aids in product penetration and sterilization. Warming Function: Ultrasonic increases metabolism, blood circulation, & blood vessel function, slows cell stimulation point, and releives pain. The vibrating effect of the ultrasonic skin scrubber gives the skin a massage while deeping penitration and cleaning. Aids in the removal of spots, wrinkles, acne, the horney layer of the skin, and clears pores and leaves your skin lighter, brighter, and tighter. We offer a variety of chemical peels in multipule levels of strength. We currently use Ayur-Medic and PCA products. Woods Lamp Analysis is an advanced way to analyze the skin by using a skin scope.​ Backed by the technology of facial topography, this skin scope can analyze the condition of the skin and detect and interpret skin problems. It has the ability to identify skin types that co-exist on an individual's face. Skin diseases and problems can be easily detected using a skin scope. It uses black light to illuminate imperfections and dryness on the skin. A woods lamp is able to examine skin in minute detail. Galvanic Current assists in deep penetration of active substances for iontophoresis and desincrustation techniques. It applies the principle of negative and positive current pulling which enhances the ability of the active molecules to penetrate the skin surface. Cooperating with nutritional solution of anion and Cat-ion to introduce nutrition into skin and harmonize skins degree of acid and alkali. It also to accelerate blood circulation and increases the skins absorption capability. It utilizes sonic vibrations to reduce lines, leaving the skin firm and smooth. It's benefits are wide and far-reaching. Helps accelerate blood circulation, improves metabolism, which allows the skin to breath. It enhances the permeability of the cells to helps the products penetrate deeper into the skin. It aids in killing bacteria, is anti-inflammatory, and enhances the immunity of the skin. LED Light Therapy accelerates the skins metabolism rate, promotes the excretion of toxins of the skin, promotes blood circulation, and lightens freckles & red blood spots. Blue LED Light: ​Medically proven to kill P acne bacteria beneath the skin. It reduces acne inflamation and drastically boost skin recovery while decreasing skin oiliness and lowering excess sebum production. This will clearing up existing acne and prevent futur breakouts. ​Green LED Light: Reduces hyperpiguentaion, discoloration, freckles, sun damage, and age spots and improves overall skin tone. ​Yellow LED Light: Reduces redness in skin tone, replenishes oxygen and energy levels in the skin cells. Proven to reduce pigment, promote lymphatic detox, improves skin texture and reduces the appearance of wrinkles. ​Cyan LED Light: Enhances cell energy and promotes skin cell metabolism. Improves oil production of the skin and promotes the synthesis of protein and collagen. ​White LED Light: Promotes tissue strength and tightens the skin reducing the appearance of sagging skin. After the client consultation and a skin analysis we will be able to determine the products and treatments that will best suit your skins needs and your overall goals in your skins appearance. At Porefessionals we use the most state of the art products tested and created in labrotories by scientists to maximize your skincare goals. PROUD TO OFFER SUNFX PRODUCTS: SunFX is the healthy sunless tanning alternative, offering perfect coverage for a fast, natural looking tan every time. SunFX spray tanning solutions are a unique combination of Organic, Natural and Hypo-Allergenic ingredients that not only deliver the perfect tan but build, nourish and hydrate the skin all at the same time. So if you want the perfect spray tan don’t settle for second best. Ask for the world’s number one professional spray-on tan. Temporary Tattoo options: Flowers, wings, swallows, fairies, butterflies, hula girls, skulls, bows, hearts, fans, crosses, horseshoes, diamonds, cherries, rockabilly, and more​. Cost is $30 per half an hour.